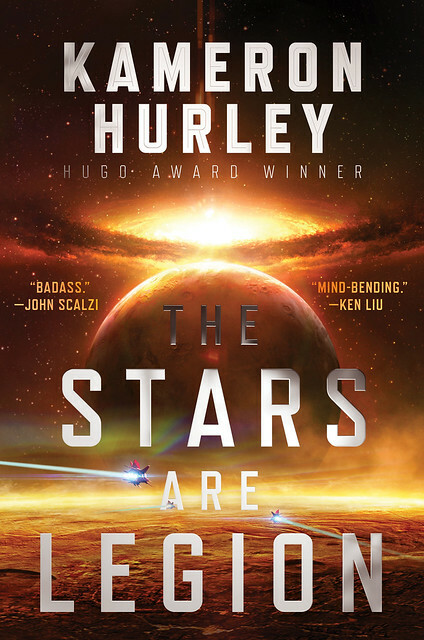 I start this Big Idea for The Stars Are Legion, by Kameron Hurley, with a disclosure: I liked the book enough to blurb it (you can see the blurb right there on the cover, above). Why did I like it? Well, as it happens, Kameron’s piece today will go a long way to explain. Humans are not suited for travel between the stars. We are fleshy bags of delicate meat, able to survive within a limited temperature range, and we are particularly sensitive to the circadian rhythms of our own planet; many of us get depressed, angry, even suicidal, when confined to dark, tight spaces. We require clean air, constant nutrition, and water in abundance. These are not optimal survival characteristics for a species that wants to navigate the extremes of space. The cold equations can be depressing, but we must also discuss the assumptions that led us to make those equations in the first place before we dismiss our options. To make epic space operas work in the past, many writers have relied on advances in powering dead hunks of metal around in a vacuum, hand-waving the laws of physics as we currently understand them and the limitations of our own bodies and psychology to simply get us where we need to go for the story to start. Kim Stanley Robinson addressed these limitations succinctly in his article, “Our Generations Ships will Sink” and explored the issue in his own novel, Aurora. But as a speculative fiction writer, I have to reject these limitations. I understand that we need to think beyond what we are now and explore what we could be. Equations, after all, are human constructs. I wanted to write a space opera with a gooey living starship that challenged our ideas of how we could navigate through space – and what we would become in order to do it. The idea behind my massive generation starships in my space opera, The Stars are Legion, then, required me to research not hunks of dead metal but living, breathing organisms and their ecosystems. I looked at parasites and symbiotic relationships between animals and the bacteria in their guts and the creatures on their skin. I found that life was both horrible and wonderful, with parasites that can change the behavior of hosts and eat them alive, but also parasites that can enable hosts to endure the unendurable. It was this idea of interconnected systems that I used to develop not dead starships, but living world ships, organisms that contained entire ecologies on their various levels that all worked together to sustain themselves. The ships could live, die, and reproduce. The human passengers, too, were just another part of the system, tied to it as we are tied to earth. They weren’t particularly special, just as we are not particularly noteworthy here on earth. They were simply another part of the whole. To build that legion of worldships also required an eye toward human failings and psychology. As the purpose of the journey faded into memory and worlds began to die around them, petty wars, insurgencies, and alliances would play out among the survivors. The two warring families at the edge of the legion became the subject of the story, each fighting to take control over a worldship with the power to leave the dying legion to places unknown. As a trained historian, I often look back at the past and consider what people thought was possible five hundred, a thousand, ten thousand years ago. And I cast my net into the future and try and look back at us, now, from the vantage of that future. That’s how I create my worlds, not by looking at what is probable or possible according to our current understanding, but what is considered possible by some far-future generation. Seeking the unreal and challenging the impossible is one of my greatest delights as an author. I chose speculative fiction because I could create other worlds whose only limits were imposed by my own biases, and failures of imagination. When you have the power to shape worlds, you might as well use it. Read an excerpt. Visit the author’s website. Follow her on Twitter. Sounds badass indeed! Scott Westerfeld’s LEVIATHAN trilogy had a living organic airship, so why not living starships? The excerpt link also includes an author interview and more about the novel’s story. I don’t think SF is exactly bereft of living starships. Still, I’m sure she does a fine job fleshing them out, so to speak. The excerpt looks weird but promising, and the concept of giant bioships is just awesome. And if it’s got a happy ending, sign me up! I started reading this yesterday after work. So far, it’s fantastic. The two classic stories I was reminded of (upon reading the introductory material here and at the excerpt link) are Robert Sheckley’s “Specialist” and C. M. Kornbluth’s novella “Shark Ship”; I would recommend them both to anyone. Reading the excerpt (and not having read any fiction by the author before), I found, to my surprise, that I had crossed some sort of lifetime threshold for tolerance of present-tense fiction. Perhaps an editor requested it in this case, but whether or not that’s true, I apparently can’t get into a story that way anymore, after 40 years of exposure to present-tense fiction. Nor am I happy about this. Anyone want a copy of Silverberg’s The World Inside or Ann Beattie’s Chilly Scenes of Winter? Regarding generation ships and Kim Stanley Robinson’s dismissal of same, I give you North Sentinel Island. The inhabitants of that island have not had human contact since at least 1867, or 150 years ago. Since inhabitants of nearby islands couldn’t understand the language of the North Sentinels, it’s suspected that the isolation has gone on longer then that. Actually, these islands are home to the Onge people, who appear to have left Africa and split off from mainland Asians 48,500 years ago. In short, we’ve ran generation ships before and are now. I am reading your book now (I am about thirty pages into it) and I am truly enjoying it! The “witches” are so fascinating . . .
Bought it Tuesday or Wednesday, but I’m in the middle of another book right now. Looking forward to reading this one.